Built in 1902 as the residential Hotel Earle, the perfectly-situated Washington Square Hotel has housed some famous residents over the years. Ernest Hemingway stayed at the hotel for a few weeks in 1914, just before he went off to World War I. The ubiquitous Village denizen Bob Dylan chose the location because it was close to his favorite bar, Minetta Tavern. Joan Baez lived with Bob in room 305 for a while. Renamed in 1986 to reflect its proximity to Washington Square Park, the renovated Washington Square Hotelis now popular with NYU parents and other not-so-bohemian tourists. We love the art deco lobby, complete with a copy of John Singer Sargent’s famous Madame X, which was painted fresco-style on tiles by the owner’s wife and perfectly sets the mood. And, finally, here's one of our favorite New York stories . . .
Several years ago, one of North Square's waitresses asked the owners if she could play a few of her songs during brunch. She gave them a demo CD, they were impressed, and she had her first gig at the Washington Square Hotel’s brunch. 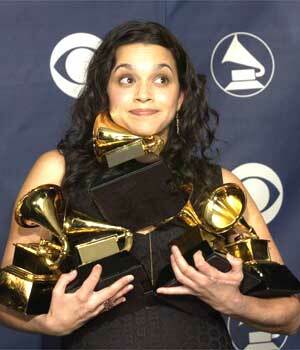 She went on the win five Grammy Awards. The waitress was Norah Jones. Washington Square Hotel is a featured curiosity on tour #2 of Cocktails & Curiosities Greenwich Village.